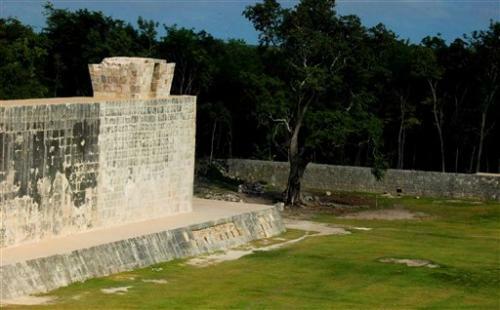 Mexican archaeologists say they have determined that the ancient Mayas built watchtower-style structures atop the ceremonial ball court at the temples of Chichen Itza to observe the equinoxes and solstices, and they said Friday that the discovery adds to understanding of the many layers of ritual significance that the ball game had for the culture. The bases of the structures—essentially, look-out boxes set atop the walls, each one with a small slit running through it —had been detected before, but archaeologist hadn't been sure what they were used for. Since the ball court was built around 864 A.D., the boxes and the stairs leading to them had crumbled.